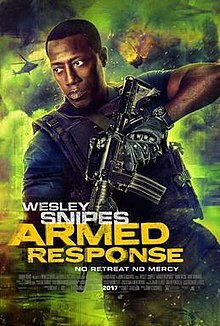 Armed Response is a 2017 American action-horror film directed by John Stockwell, and produced by Wesley Snipes, who also starred in the lead role. The film co-stars Anne Heche, Dave Annable and Colby Lopez (best known as Seth Rollins). The film is produced by Erebus Pictures, a collaboration between WWE Studios and Gene Simmons. It has a 0% score on Rotten Tomatoes. The film was released in the United States on August 4, 2017. A team of trained operatives find themselves trapped inside an isolated military compound after its artificial intelligence is suddenly shut down. There, they begin to experience strange and horrific phenomena as they attempt to uncover what killed the previous team. ^ "Saban Films Acquires John Stockwell's Armed Response from WWE® Studios, Gene Simmons and Erebus Pictures Film Stars Wesley Snipes, Anne Heche, Gene Simmons and Dave Annable - Saban Films". www.SabanFilms.com. Retrieved October 21, 2017. ^ Jr, Mike Fleming (April 5, 2016). "Wesley Snipes & Anne Heche Topline 'Temple' For Gene Simmons & WWE Studios Genre Label Erebus". Deadline. Retrieved June 18, 2016. ^ "WWE Studios, Gene Simmons join forces to launch Erebus Pictures". www.wwe.com. Retrieved June 18, 2016. ^ "Armed Response - Movie Reviews - Rotten Tomatoes". www.RottenTomatoes.com. Retrieved October 21, 2017. This article about a 2010s action film is a stub. You can help Wikipedia by expanding it. This article about a 2010s horror film is a stub. You can help Wikipedia by expanding it. This page was last edited on 5 December 2018, at 13:26 (UTC).